Whether you’re already using Pinterest in your marketing strategy or not, these Pinterest tips for small businesses and brands will help you make sure you’re maximising the platform’s potential to generate leads, sell products or increase brand awareness (or all three). With 250m+ people using Pinterest each month, there are huge opportunities for marketers to get their message in front of people who are seeking inspiration or ideas. As with other social platforms, it’s important to know your audience and what kind of content they’re open to consume. Hear that? They’re actively seeking helpful ideas. Make sure you’re there to swoop in at the right moment with a useful piece of content to make their lives easier. Use keyword-rich descriptions. Pinterest is essentially a search engine, rather than a social network, so you need to think SEO-first. Be specific, descriptive and use words or phrases to describe the content of the Pin. Use hashtags. No more than 20 per Pin, and try to aim for hashtags that have around 1,000 to 10,000 uses. Any more, and you’ll be lost in the noise. Any less, and it’s probably not worth your while. Double-check the content that arises by searching the hashtag to make sure the results are relevant to your Pin. Make sure they’re at the end of your description, not the beginning. Think mobile-first. 80% of people use Pinterest on the mobile app. Ensure that the original Pins you’re creating look just as good on mobile as they do on desktop. Claim your website. Your profile picture will show up next to any Pins originating from your site, and you’ll also get access to website analytics for insight into what content your audience saves the most. Here’s how. Set up Rich Pins. This is a no-brainer: once your site has Rich Pins enabled, any time someone shares a page from your site, the Pin will be richer and more engaging by displaying metadata from the page itself within the Pin. Find out how to set them up. Prioritise quality over quantity. While frequent Pinning is advised, make sure you stick to quality content that’s relevant to your audience. Pin consistently. Don’t post 50 Pins one day, and none for the rest of the week. It’s better to be slow and steady. SmarterQueue will help you space your Pins out evenly throughout the week so you can add in bulk, and leave them to publish automatically on a consistent schedule. Exercise caution with Group Boards. Pin quality content to quality boards. Don’t join Boards with 100+ collaborators: the quality is likely to be low. Read more about Group Boards with this in-depth guide from Louise Myers, as there’s a lot to cover. Create bespoke imagery to share your blog posts. Beautifully designed vertical Pins command more attention in the feed, so your blog’s automatic header probably isn’t the absolute best option. Name your Boards strategically. Make them specific, relevant to your audience (with appropriate keywords), and pick a category for each Board. Add the Save button to your website. Make it as easy as possible for people to share your content. Add a call to action on your blog posts to remind people, too. Use analytics to improve performance. Use SmarterQueue’s analytics to measure the success of your Pins and optimise your strategy accordingly – it’s surprising how much you can learn! Add text to your images. While other platforms discourage too much text, infographic-style images work well on Pinterest, and can add a taster of what’s to come if users click through to your site. A/B test your Pins. SmarterQueue allows you to set up alternative versions of Pins when scheduling them so you can test different creative or captions against one another. How do you use Pinterest for your brand? Any tips you’d like to share with us? Let us know your thoughts in the comments. 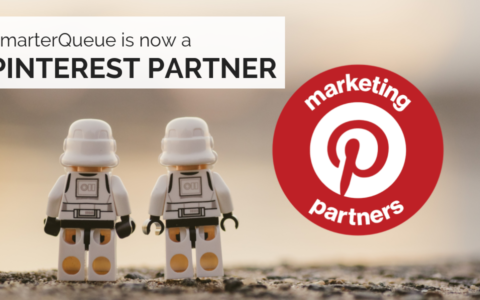 And don’t forget – SmarterQueue is an official Marketing Partner of Pinterest, allowing you to curate, schedule and analyse Pins.